Kohinoor Business School, Kohinoor Education Complex, Kohinoor City, Kirol Road, Off. LBS Marg, Vidyavihar/Kurla (W), Mumbai – 400070. Kohinoor Business School presents an intercollegiate mega fest titled ‘Fest-O-Mania – 2015’. 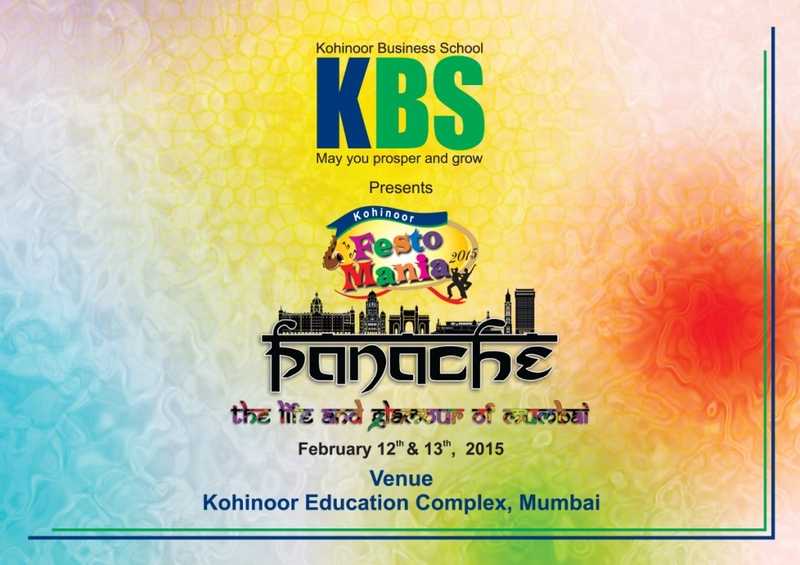 The theme of this year’s event is ‘PANACHE - THE LIFE AND GLAMOUR OF MUMBAI. It is a two day event starting from 12th to 13th February 2015. Students from various management colleges across Mumbai participate in this mega competition. Fest-O -Mania has a range of management games, sports and cultural events like ADZAP, Business Housie, Business Plan, Business Quiz, Jumble fumble, Debate, Beg Borrow Steal, Mock Stock, Chess, Minesweeper, Tug of War, Table Tennis, Box Cricket, Snake & Ladder, Solo Dance, Singing, Photography, Short Film, Soap Carving, Fashion Show and many more. Venue: Kohinoor Business School, Kohinoor Education Complex, Kohinoor City, Kirol Road, Off. LBS Marg, Vidyavihar/Kurla (W), Mumbai – 400070.